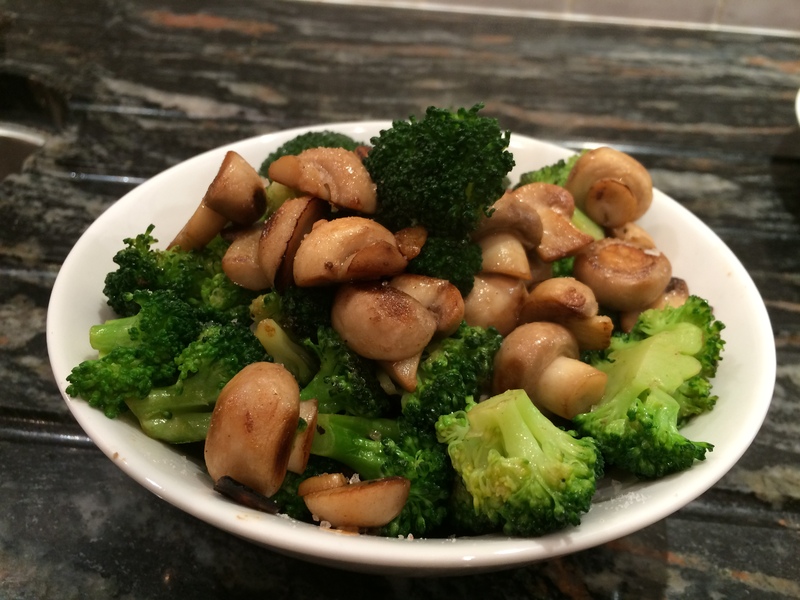 I love mushrooms and I also love broccoli and the two together make a delicious dish. I haven’t stated quantities of broccoli or mushrooms as you can make as little or as much as you want. A large head of broccoli and a pack of baby mushrooms is usually what I use and you can ring the changes by using different varieties of mushroom although I do like the little baby button mushrooms in this dish. Clean the mushrooms and if large, cut in half. Don’t slice them too thin as they shrink quite a bit on cooking. Heat the oil in a non-stick pan and add the chopped garlic. When the garlic becomes aromatic, add the mushrooms and sauté on high heat for 1 to 2 minutes then reduce the heat to medium and let them cook uncovered for a further 3 to 4 minutes. Meanwhile, microwave the broccoli florets in a bowl with a very small amount of water for just 2 to 2.5 minutes. They should be medium firm, moist and bright green. Add the broccoli to the mushrooms in the pan and sprinkle over some salt and freshly ground black pepper. Mix well and continue to cook for another minute or two. Serve warm as a side salad, as an appetizer or even on its own as a supper dish. A few shavings of Parmesan would make a tasty addition; alternatively add a few chilli flakes when cooking the garlic. This entry was posted in Salads, Supper, Vegetables and tagged Broccali, Gluten Free, Healthy Eating, Lunch, Mushrooms, Salad, Vegetables, Vegetarian. Bookmark the permalink.